Bold Type Books, 9781560258025, 488pp. 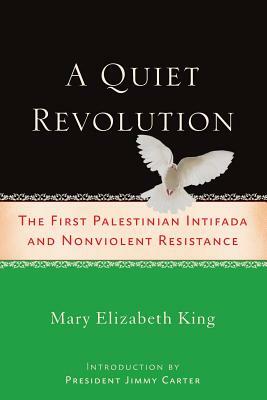 In A Quiet Revolution, renowned civil rights activist Mary Elizabeth King questions the prevailing wisdom that the first Palestinian Intifada was defined by violence. She argues that initially, the uprising was characterized by a massive nonviolent social mobilization, rooted in popular committees often steered by women. These committees adopted strategies that began to lead to political results  among them the beginnings of a negotiated settlement. King traces the tragic movement away from peaceful protest following the killing of four Palestinian laborers in Gaza, and charts the PLOs increasing contempt for nonviolent struggle. She details the complicity of the media in this escalation of violence  TV crews would not cover peaceful protests, but Palestinian boys throwing rocks at Israeli soldiers would attract foreign cameras. King draws upon the history of non-violent movements and argues that only through nonviolent strategies can a negotiated peace be achieved with Israel. King believes that the residual knowledge of the power of nonviolent resistance from the first Intifada will provide the bedrock upon which to build this eventual, lasting peace. Mary Elizabeth King is an expert on Nonviolent Political Strategies and worked alongside Martin Luther King, Jr. as a student. She is a Professor of Peace and Conflict Studies at the University for Peace of the UN, and a Distinguished Scholar at the American University Center for Global Peace in Washington, DC. She is the author of "Freedom Song" (which won the RFK Memorial Book Award) and "Mahatma Ghandi and Martin Luther King, Jr.: The Power of Nonviolent Action." King lives in Washington, DC.